This is the fourth essay in a series dedicated to analyzing the U.S. eligible-voter population using the 2018 American National Election Study (ANES), an online survey administered in Dec. 2018 by researchers from the Univ. of Michigan & Stanford Univ. 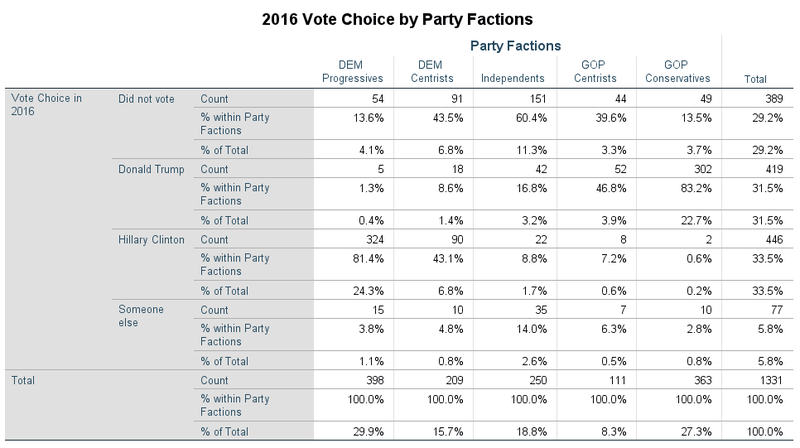 According to an analysis of the 2018 ANES, Progressive Democrats represent roughly one-third of the American eligible-voter population and two-thirds of all Democrats; and, by some accounts, are the ‘center of gravity’ in American politics today. But the progressives have a problem. A big problem, if they want to win back the presidency in 2020. Progressive Democrats are deeply divided. That is does not sound like a breaking news story to anyone that has followed politics in the last two years. But the usual media narrative goes something like this: Establishment Democrats, centrist and pragmatic in nature, are being pulled (presumably against their better judgment) to the far left by their progressive counterparts in the party. 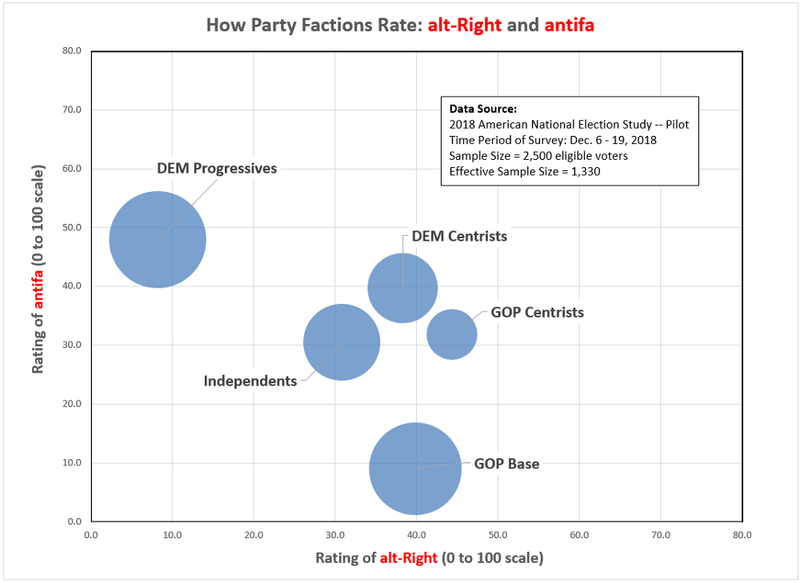 This narrative often gets confounded with the notion of a progressive versus centrist divide where the party establishment is generally linked to the centristfaction. However, as discussed in a previous essay, when we look at the attitudes of actual voters, the Democratic Party’s establishment wing — often represented among politicians by Nancy Pelosi, Chuck Schumer, Tom Perez, Joe Biden, Kamala Harris, etc. — is a much better match with the progressive voters in the party, not the centrists. Democrat-leaning centrists are decidedly more conservative than their progressive counterparts on abortion and LGBTQ rights, climate change, immigration policy and a whole host of other core issues that tend to define the mainstream of the Democratic Party. When we talk to flesh and blood human beings, not politicians, the mainstream Democratic Party voter is progressive, not centrist — and the party’s establishment, on most issues, stands squarely with the progressive mainstream. But this is where it gets tricky and where the political media often gets it wrong when they discuss progressive Democrats. 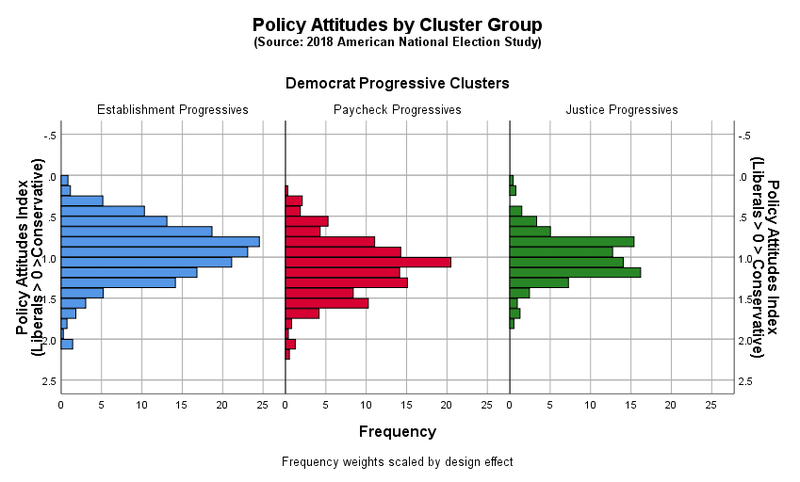 Labeling someone a ‘progressive Democrat’ is not analytically useful unless you are identifying a specific type of ‘progressive Democrat.’ But the progressive types are not related to variation in policy attitudes (as we might assume). 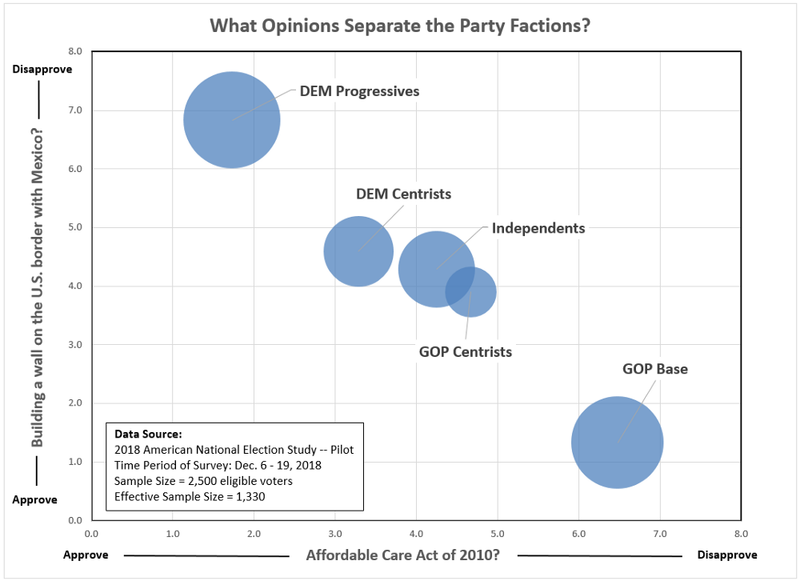 The Progressive Democrats (identified in my earlier segmentation analysis of the 2018 ANES) share, by construction, similar views on: abortion rights, LGBTQ rights, health care policy, gender equality, immigration, social spending, climate change, and racial discrimination (see Figure A.1 in the Appendix). 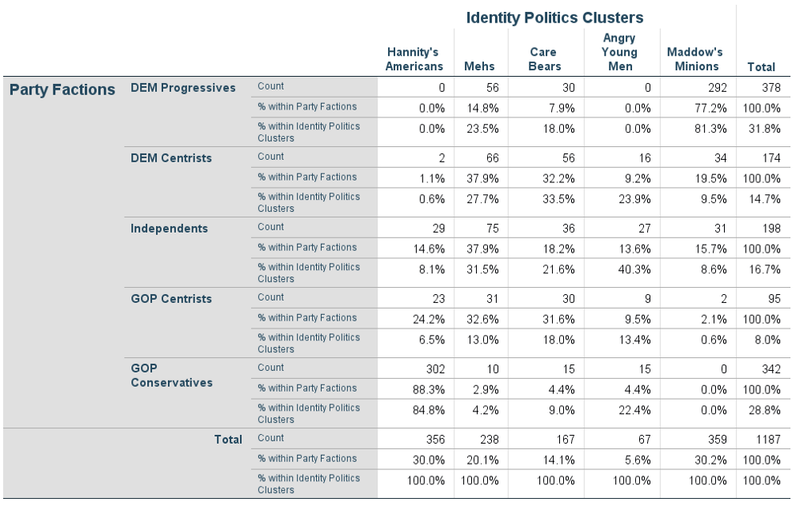 In my subsequent drill-down into Progressive Democrats (using a K-means clustering algorithm) I find three distinct subgroups based on respondents’ personal orientations and emotional attachments to common elements found in the political world (i.e., groups, identities, individuals, etc.). And further analysis finds these differences to be associated with substantive variation on candidate preferences. 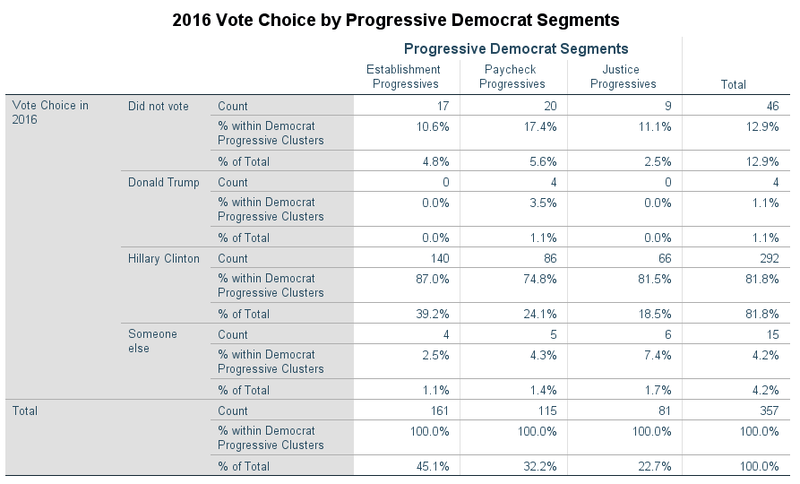 Establishment Progressives (45% of all progressive Democrats): Relative to the other two segments, these are progressives with strong affinities towards racial and ethnic groups, the LGBTQ community, the police, capitalists, Hillary Clinton, Special Counsel Robert Mueller, and the FBI. 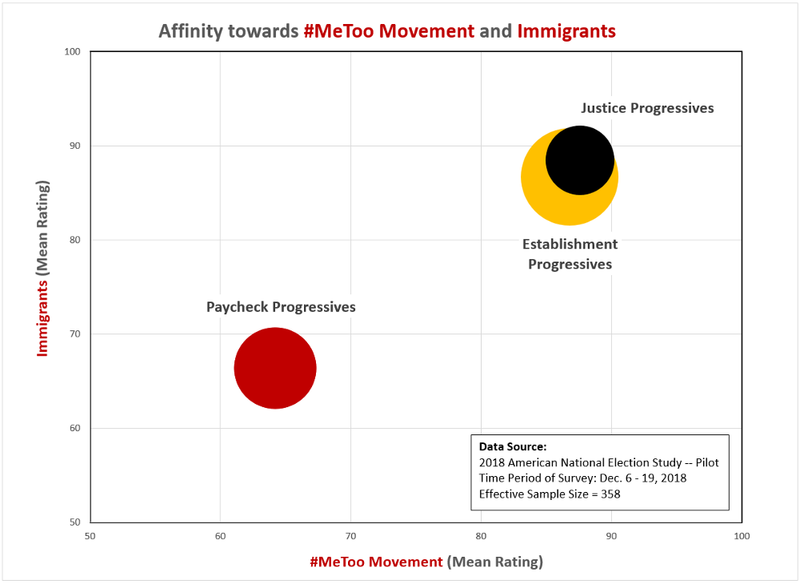 Paycheck Progressives (32% of all progressive Democrats): Again, relative to the other segments, these are progressives with lower affinities towards racial and ethnic groups, immigrants, the LGBTQ community, Hillary Clinton and the #MeToo movement. 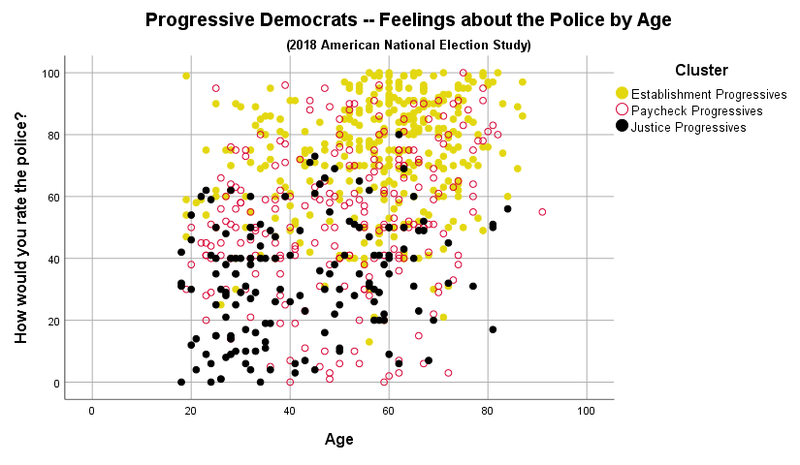 Justice Progressives (23% of all progressive Democrats): And, finally, these progressives show strong relative affinities towards racial and ethnic groups (except whites), the LGBTQ community, the #MeToo movement, immigrants, socialists, but low affinities towards whites, capitalists, rural Americans, journalists, the police, the FBI, Special Counsel Robert Mueller, Hillary Clinton, and the U.S. Supreme Court. By construction, the three segments differ in their orientation towards various people and social groups, but they also differ in terms of demographics and behavior. The most apparent difference is age (see Figure 6). 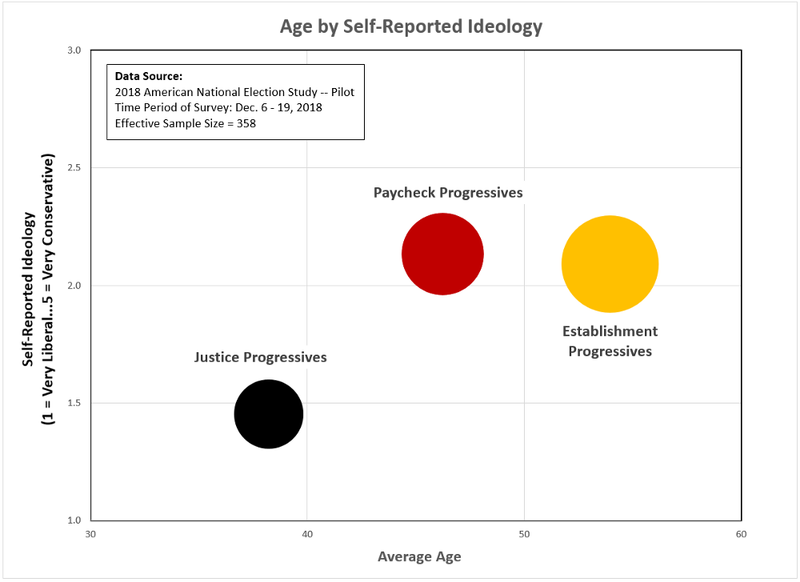 Justice Progressives are the youngest segment (mean age = 38), followed by Paycheck Progressives(mean age = 46), and the Establishment Progressives (mean age = 54). Another factor separating the progressive segments is self-reported ideology. 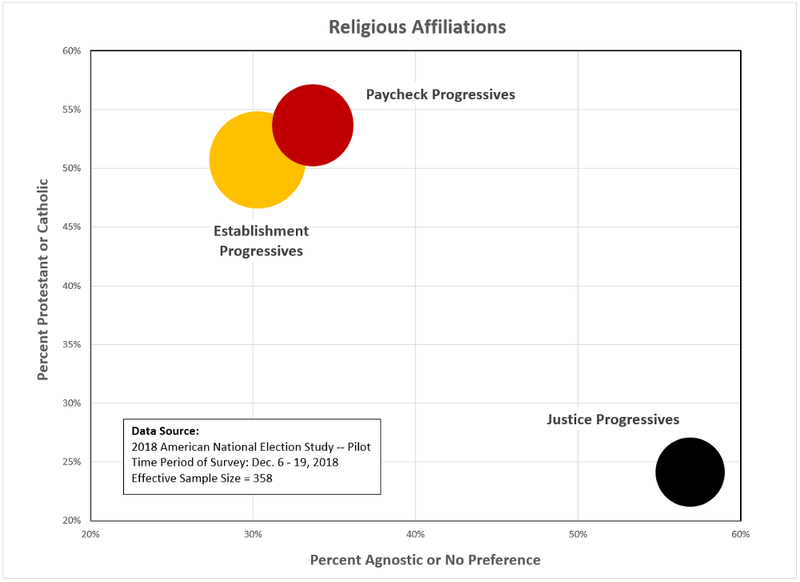 Justice Progressives are most likely to call themselves ‘‘very liberal’ (59%), while Paycheck Progressives and Establishment Progressives are most likely to call themselves ‘somewhat liberal’ or ‘moderate’ (71% and 70%, respectively). 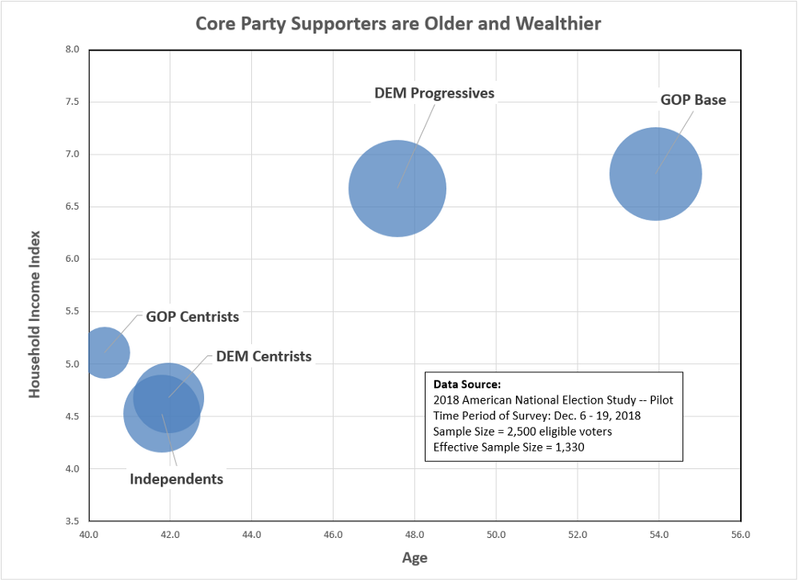 In a multinomial logistic regression analysis, age and self-reported ideology proved to be the most significant predictors of membership in the three progressive segments. 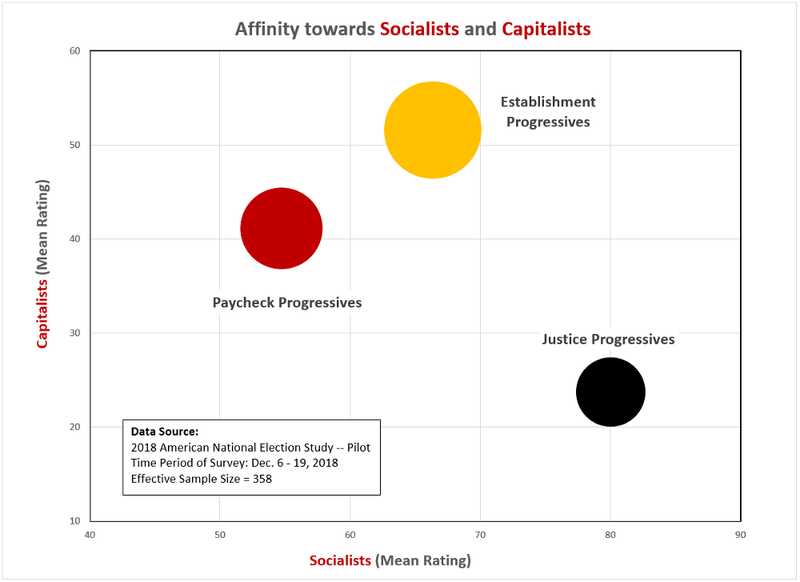 Those relationships are evident in Figure 7, particularly in how those factors distinguish Justice Progressives from the other two segments. 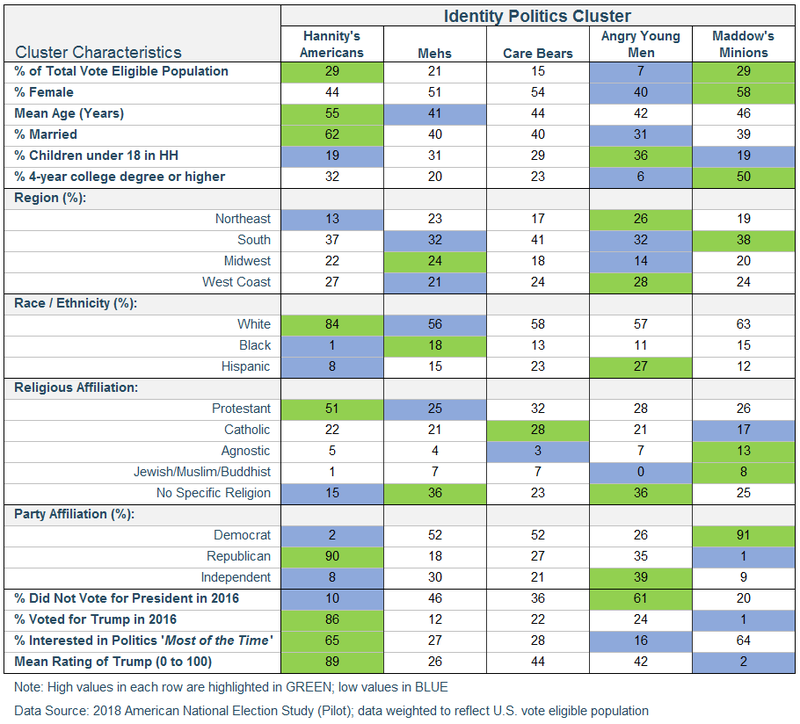 Gender, age, education, life-stage, and group affinities were central to the naming of the three progressive segments (Figures 8 and 9 show how gender, education, and religious affiliation differentiate the segments). 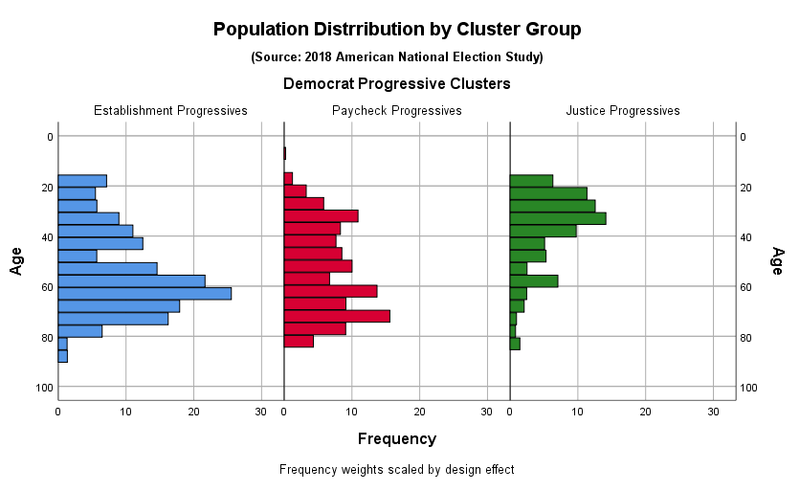 Notably, differences in racial and ethnic characteristics are not statistically significant across the three segments (though, directionally, the Justice Progressives do appear to be more racially and ethnically diverse). Establishment Progressives tend to be female, older, wealthier, pro-capitalism, and very tuned in to the Robert Mueller investigation. Paycheck Progressives tend to be male, middle-aged, married (with children) and at a point in their life when they are more likely to be concerned about a mortgage payment than identity politics or the Mueller investigation. Finally, Justice Progressives are the prototypical image of progressives offered by the media: female, young, highly-educated, non-religious, anti-capitalist, and more concerned about ‘white privilege’ and identity politics than the Mueller investigation. 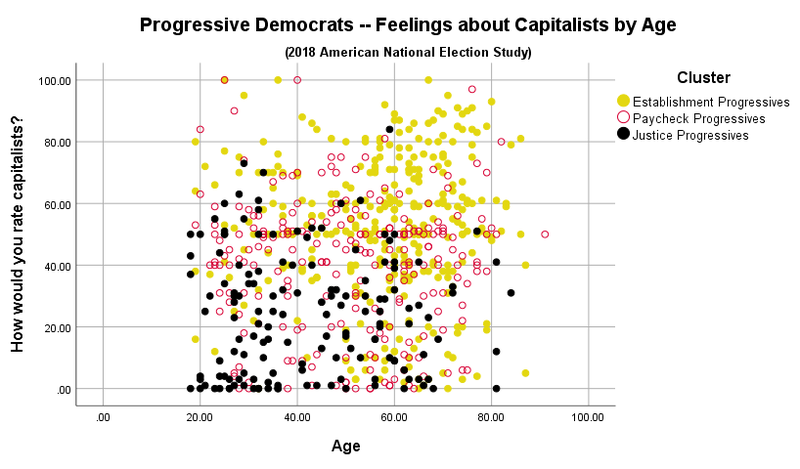 If it helps to put faces on the segments, Establishment Progressives might be represented by Hillary Clinton and Nancy Pelosi, Paycheck Progressives by Joe Biden and New Jersey Senator Cory Booker (admittedly, rough fits here), and Justice Progressives by New York Representative Alexandria Ocasio-Cortez and California Representative Ro Khanna. 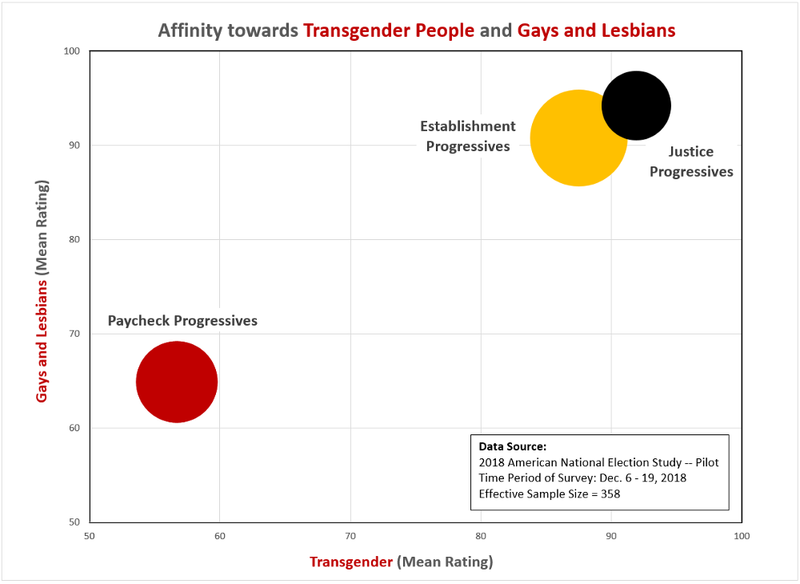 Having established the demographic differences, there are also behavioral factors that distinguish the progressive segments — in fact, its these factors that make the segments relevant to the Democratic Party’s strategy going into the 2020 election. The suspected culprits behind Hillary Clinton’s defeat to Donald Trump in 2016 are many, not the least of which are the Berniecrats who some have claimed disproportionately either voted for Trump, voted for a third party candidate, or did not vote. That dispute won’t be settled here, but the progressive segments give us some clues. In an earlier essay, I determined that 81 percent of Democratic Progressives, the most liberal voter segment, voted for Hillary Clinton (14 percent did not vote, 4 percent voted for a third party candidate, and 1 percent voted for Trump). 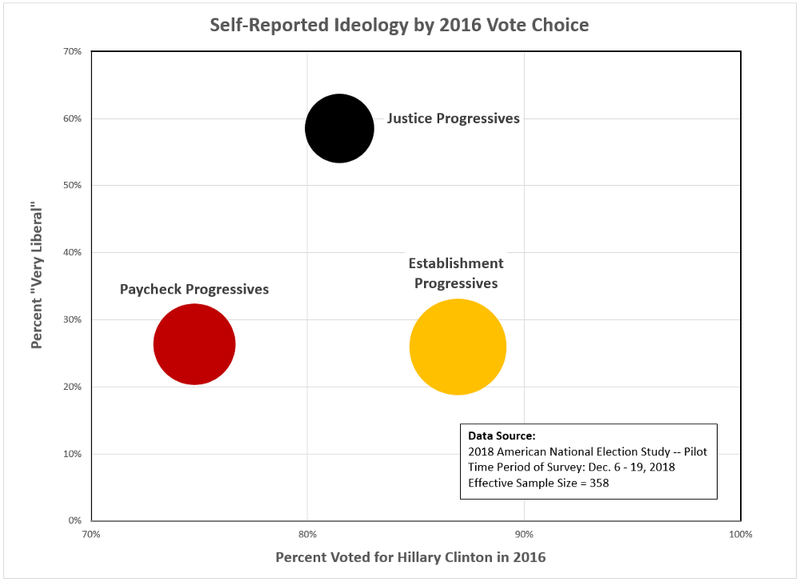 When we breakout the Clinton vote by the three progressive segments in Figure 10, we have a likely suspect for the bulk of defections from Clinton: Paycheck Progressives (of whom only 75 percent voted for Clinton, 17 percent did not vote, 4 percent voted for a third party candidate, and 4 percent voted for Trump). 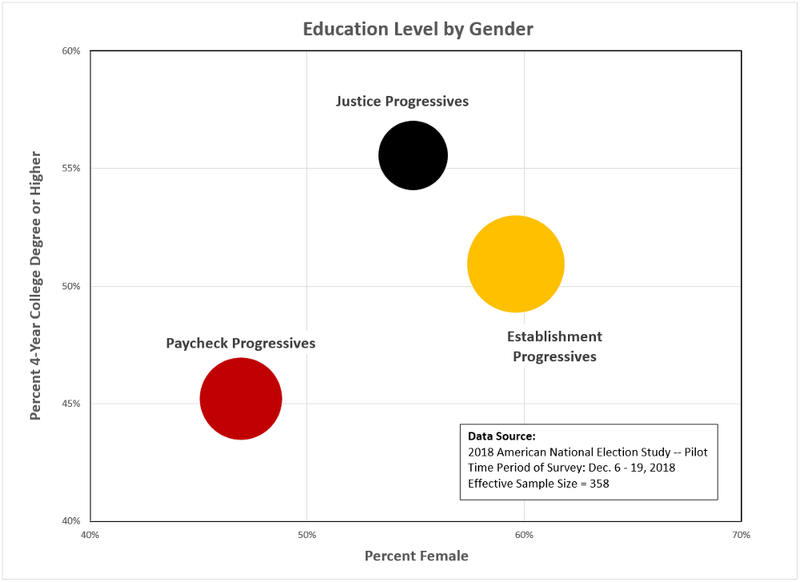 If I am hearing cries of ‘sexist pigs,’ it is understandable given that Paycheck Progressives skew male — but, given the small sample size (115 respondents), there is no statistically significant difference in the 2016 voting behavior of male Paycheck Progressives and female Paycheck Progressives. 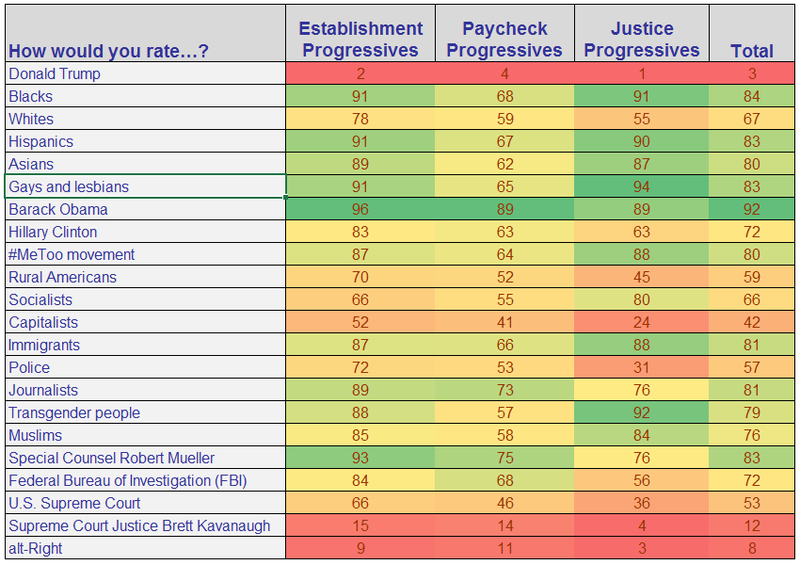 But if we are going to call out the Paycheck Progressives, we must also throw a stink-eye gaze at the Justice Progressives, who also voted for Clinton at a lower rate than Establishment Progressives (75% versus 87%, respectively). If the two segments had voted for Clinton at the same rate as the Establishment Progressives, in all likelihood, Clinton wins Florida, Wisconsin, Michigan, Pennsylvania and the presidency. 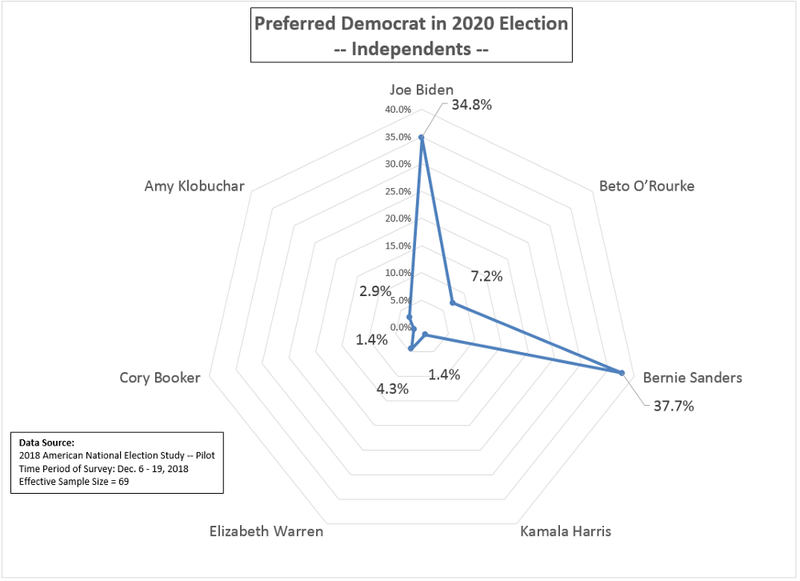 Finally, the 2018 ANES also asked likely 2020 Democratic Party primary voters which candidate they currently prefer (see Figure 11). 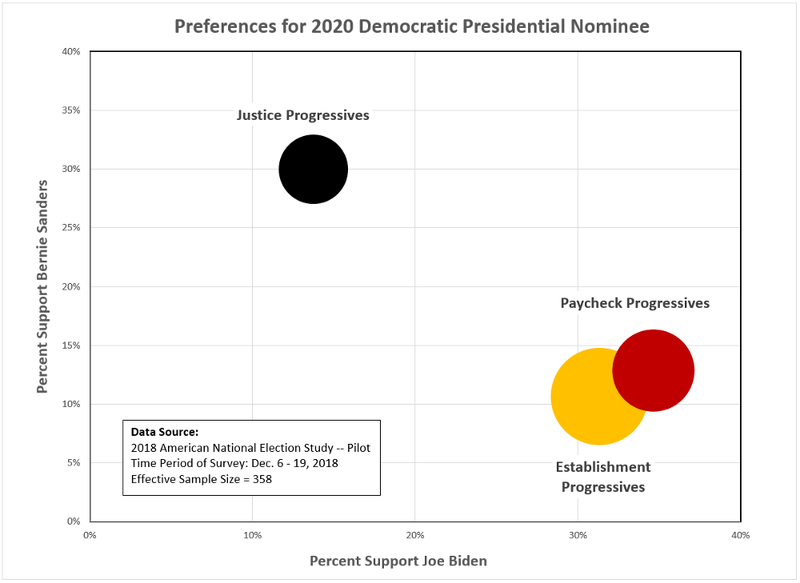 When this preference is crossed with the progressive segments, we get some validation of the segmentation categories — 30 percent of Justice Progressives prefer Bernie Sanders, while over 30 percent of both Paycheck Progressives and Establishment Progressives prefer former Vice President Joe Biden. 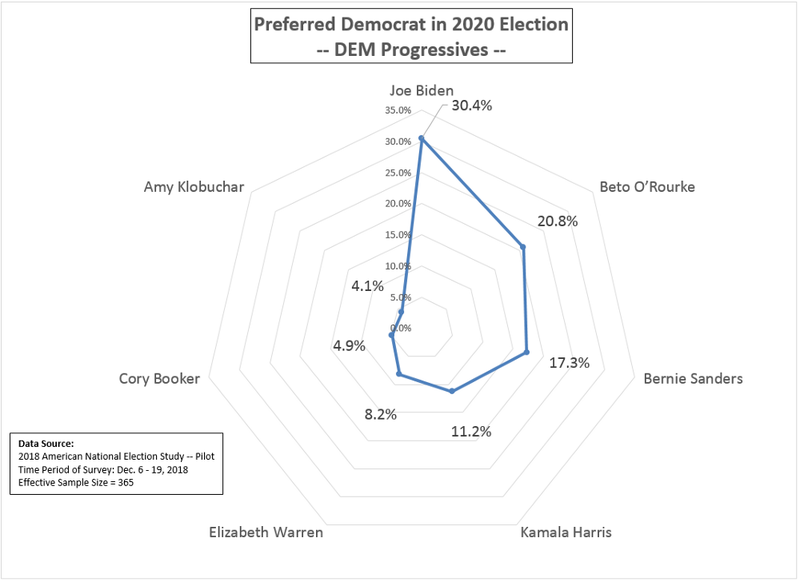 The progressive segments mate nicely with 2020 vote preferences, keeping in mind that most of the now declared Democratic candidates for president were not well known in December 2018 when the survey was conducted. In fact, only three candidates exceed 10 percent support among Democrats in the survey (Biden, Sanders, and Beto O’Rourke). 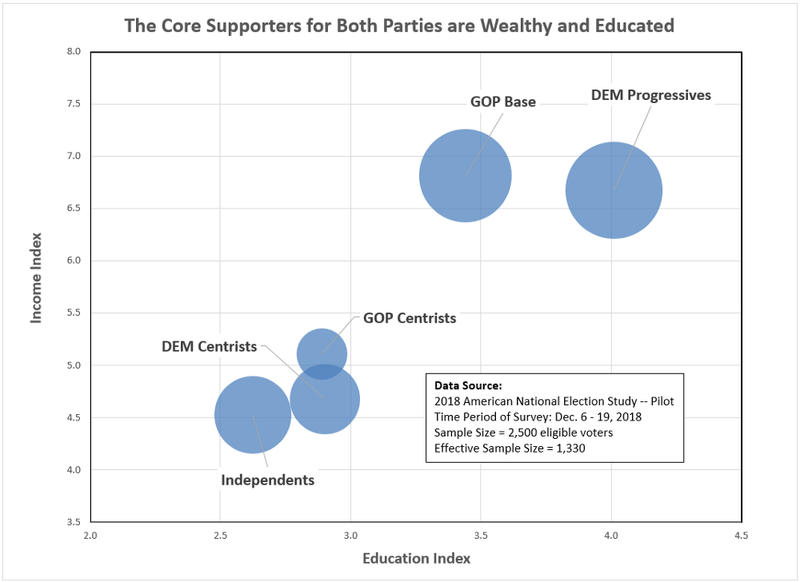 Still, this segmentation should cause some worry among Sanders supporters, as the two largest progressive segments, representing three-quarters of progressives, are not (currently) fertile territory for finding Sanders support. 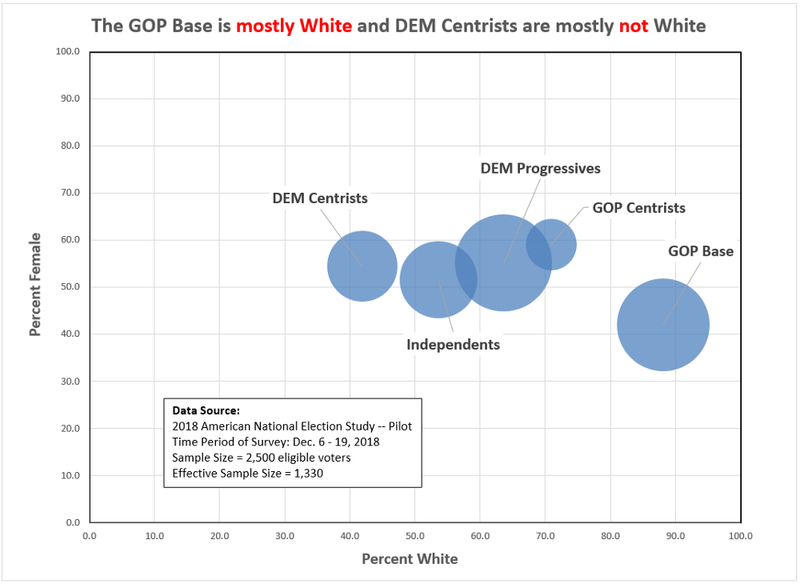 Keep in mind, this analysis does not look at the other Democratic Party-aligned voter segment — Centrist Democrats — which is a group, surprisingly, where Sanders does relatively well, according to the 2018 ANES. 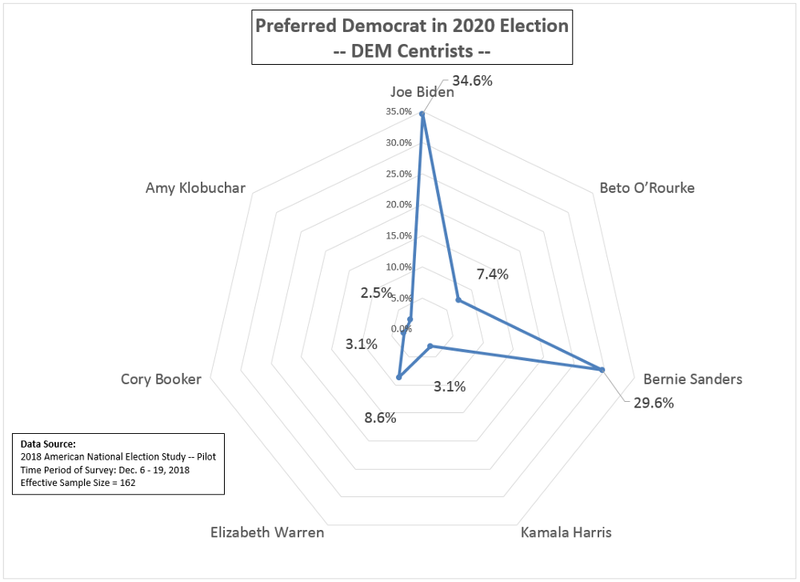 Democratic Progressives however exceed their Centrist allies in market share by 2 to 1 and it is hard to envisage the Democratic Party’s ‘center of gravity’ being anywhere but with the progressives in 2020. Yet, within the progressives, existing divisions — which at least marginally impacted the 2016 election outcome — could easily do so again. Still, Establishment Progressives are the largest force within the party’s progressive wing, and by extension, the most dominant force in the Democratic Party. Unless something dramatic happens, that is bad news for Berniecrats. This is the second essay in a series dedicated to analyzing the U.S. eligible-voter population using the 2018 American National Election Study (ANES), an online survey administered in Dec. 2018 by researchers from the Univ. of Michigan and Stanford Univ..
How best to measure racism has long been debated in the political science, psychology and sociology research communities where the measures that have been developed inevitably meet with significant criticism. The direct, self-reported method, in which researchers ask respondents directly whether they prefer their own race over others, is the most commonly used measure of individual racial bias. Using direct measures, research shows that individual racist beliefs have been in decline since the 1970s, according to longitudinal data from the General Social Survey. Disputing this conclusion, some social scientists argue that social desirability bias —where respondents give answers based on what they believe to be ‘socially acceptable’ answers as opposed to how they actually feel — invalidate direct racism measures. However, recent research by University of Virginia psychologist Jordan R. Axt compared direct and indirect measures of racism and found that “the best method to measure individuals’ explicit racial attitudes is to ask about them directly.” People are generally honest when they answer survey questions on racial attitudes. The direct versus indirect racism measures controversy will not be resolved here, however, and I do not out-of-hand dismiss the criticism that direct measures under count actual levels of individual racism. 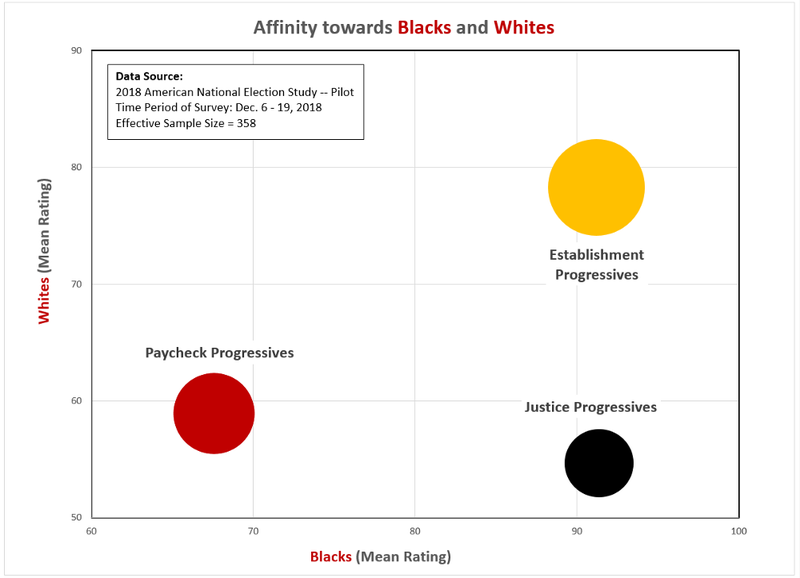 With that caveat, this article— the second where I analyze 2018 American National Election Study (ANES) data — focuses on a series of direct racial attitude questions asking about respondents’ on a 0-to-100 scale their favorability ratings towards other races and ethnicities versus their own (White, Black, and Hispanic). 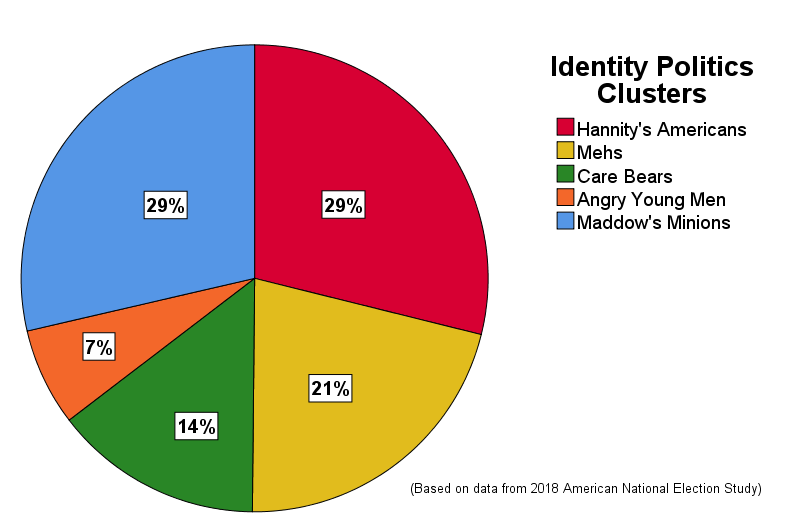 In addition, I focus exclusively on white respondents in the 2018 ANES. People of other races and ethnicities can, of course, be racist too. 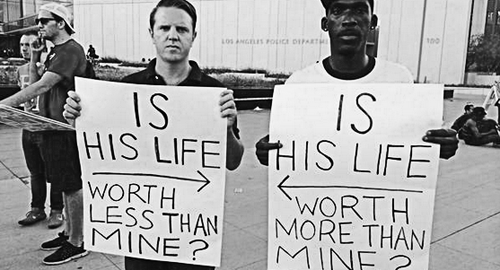 But for the sake of clarity, I target the segment in society most populous and historically most privileged. How I define a ‘racist’ in this study is also straightforward. If the white respondent rated their race higher than another race or ethnicity (Black, Hispanic) by more than 10 scale points, they are coded as ‘racist.’ Some will argue that this definition is too harsh; while others might argue even a 1-point difference indicates something racist. That is a debate for another day. Using my definition, there is one striking conclusion in the 2018 ANES data: Ethnocentric and racist attitudes are common among Americans — and no political party or ideology is immune from its presence. Among vote eligible white Americans, 34 percent favor their race over Blacks or Hispanics, or both (see the third table in Figure 1). Using the political faction segmentation from my previous essay, the highest presence of racial favoritism is among Democrat Centrists (50%), GOP Centrists (49%), and GOP Conservatives (46%). The lowest presence is among Democrat Progressives(10%) and Independents (31%). This racial bias can also be observed in Figures 2 and 3 which plot each respondent based on their favorability rating for white, Blacks and Hispanics. 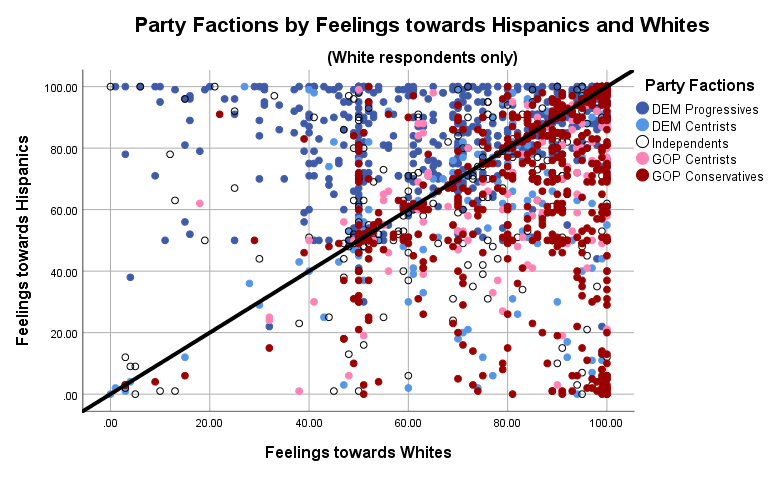 Figure 2 shows white and Black favorability scores and individual cases of racial bias are represented by dots below the diagonal line (i.e., white favorability is higher than black favorability). 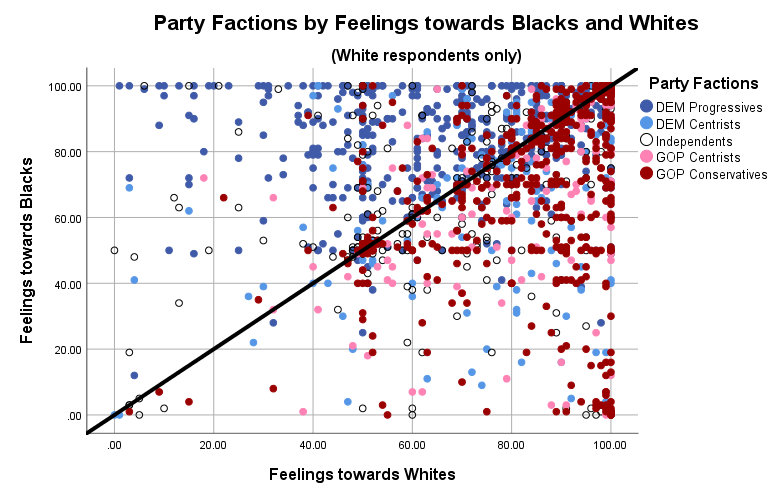 While most cases plot near the line, we see the obvious correlation between party factions and racial favorability. GOP Conservatives and Centrists are below the line and a high percentage are well below (10 points+) the line. 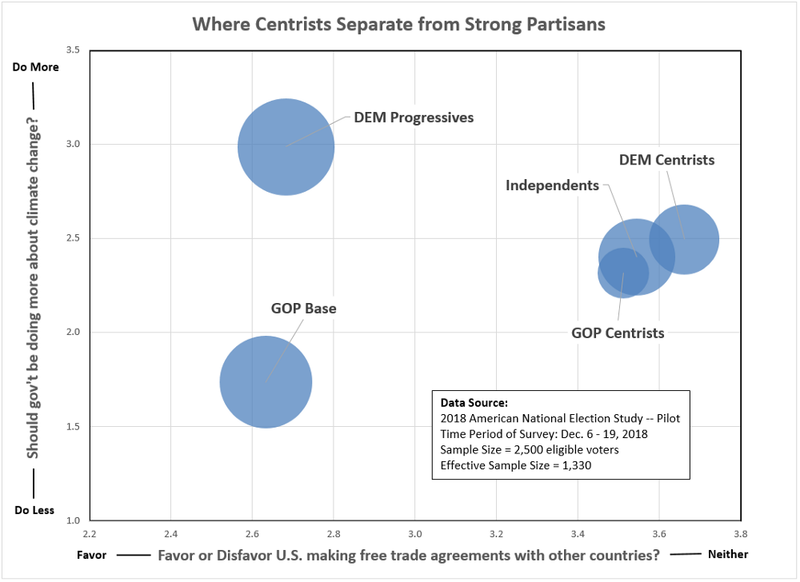 Conversely, Democrat Progressives are mostly well above the line; while a sizable percentage Democrat Centrists appear on both sides. 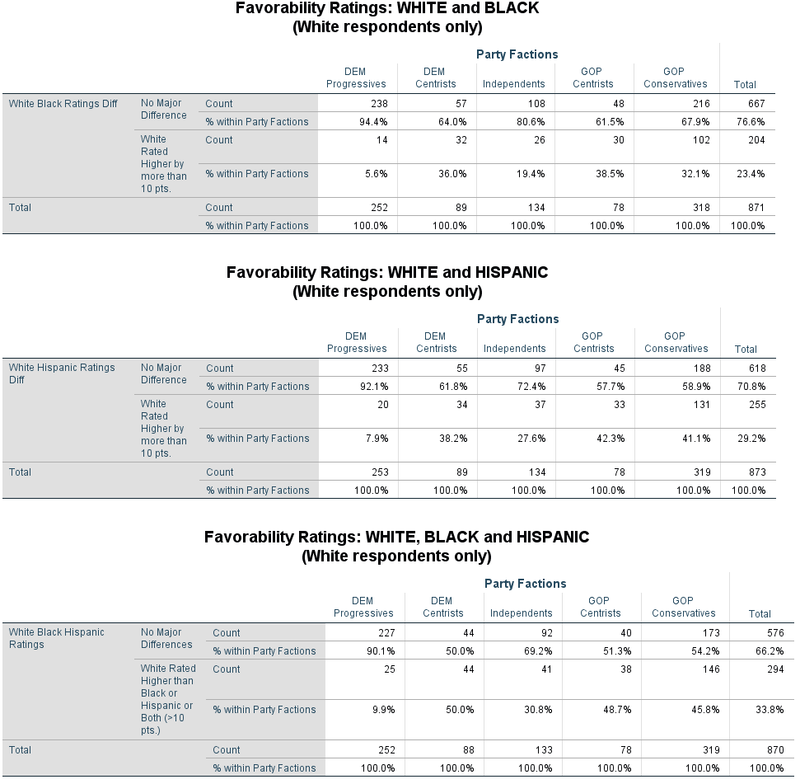 A very similar pattern emerges when comparing favorability ratings for whites and Hispanics (see Figure 3). 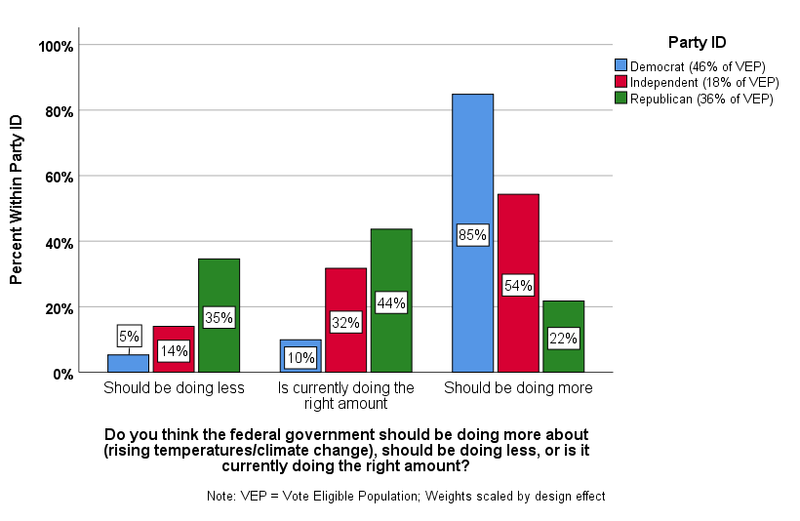 Republicans are generally below the diagonal line, while Democrats are above the line. Before Democrat Progressives start crowing about these findings, keep in mind that racial bias is only one noxious bias present in our society. There are many other types of biases: economic class, gender, sexual orientation, religious, geographic, age, education, political ideology and others. Rest assured, Democrat Progressives possess their fair share of socially corrosive biases. But that, as well, is a debate for another day. First, let us establish that feelings about President Trump are strongly related to political attitudes (and party factions). Figure 4 illuminates that relationship. 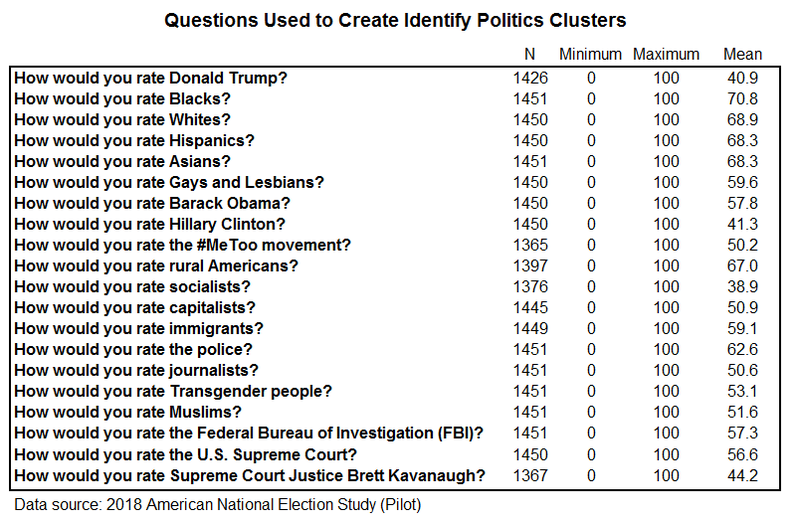 Plotting political attitudes for all respondents in the 2018 ANES — based on a series of policy-related questions — against how respondents rate Donald Trump, we see a strong relationship. 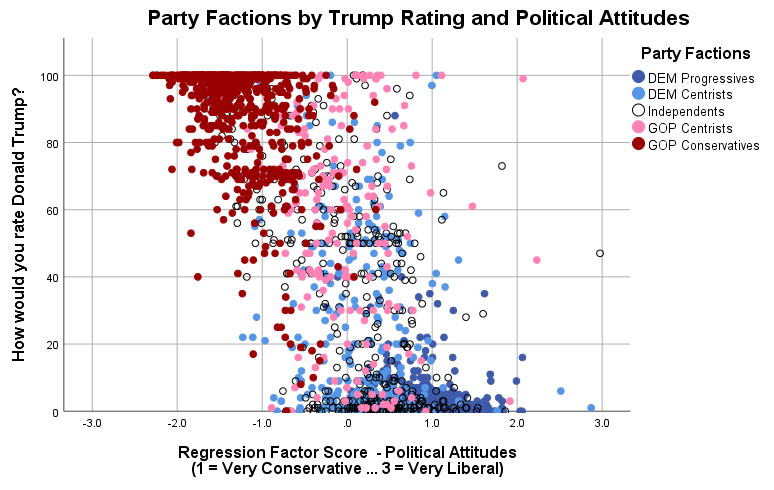 The bluish dots (Democrats) tend to rate Donald Trump low and are to the right along the political attitudes index (i.e., possess liberal political attitudes). In contrast, the reddish dots tend towards the upper left-hand quadrant of the chart (i.e., rate Trump highly and have conservative political attitudes). 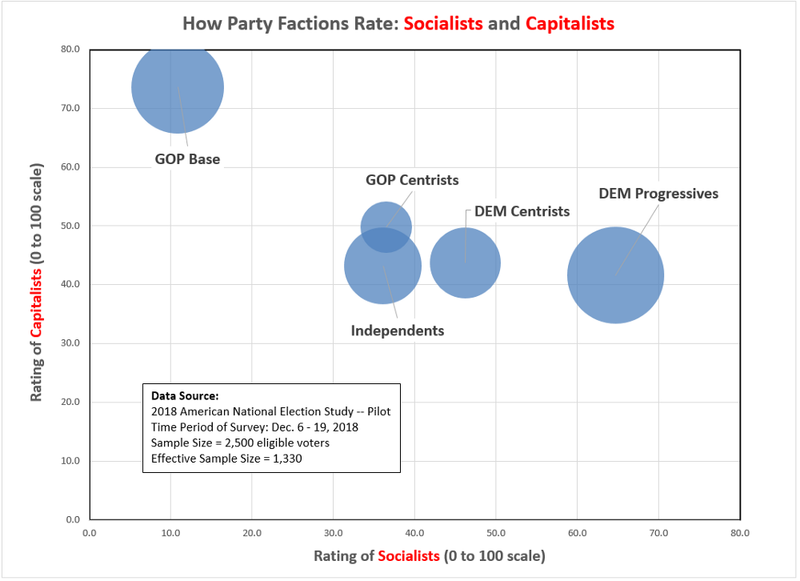 Interestingly, GOP and Democrat Centrists and Independents are sprinkled throughout the chart in Figure 4. There are a lot of them and their views on Trump don’t relate to partisan policy attitudes. I would call that a tactical opportunity for both parties heading into the 2020 election. But that is a topic for another essay. Based on this essay’s definition of a racist attitude, there is a clear (but not deterministic) relationship between racist attitudes and feelings regarding Trump and political attitudes (see Figure 5 below). Most, but not all, of the black and yellow dots (racists) are in the upper left-hand quadrant of the chart. However, it is not an air tight relationship. 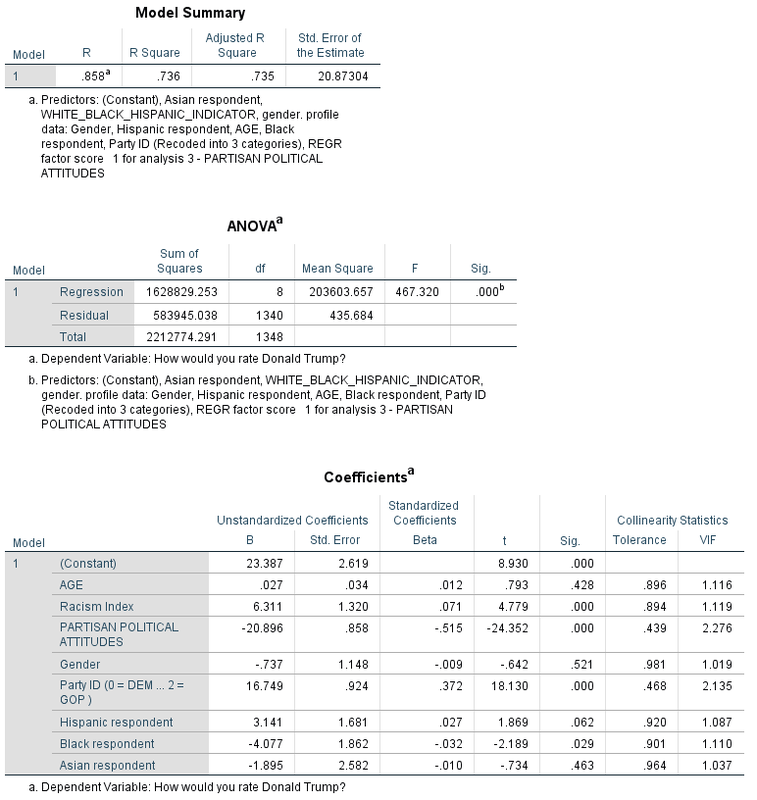 The Kendall tau-b statistic of association for racist attitudes and feelings towards Trump is 0.21 (significant at the 0.01 level, two-tailed test), and with political attitudes it is only -0.19 (also statistically significant). 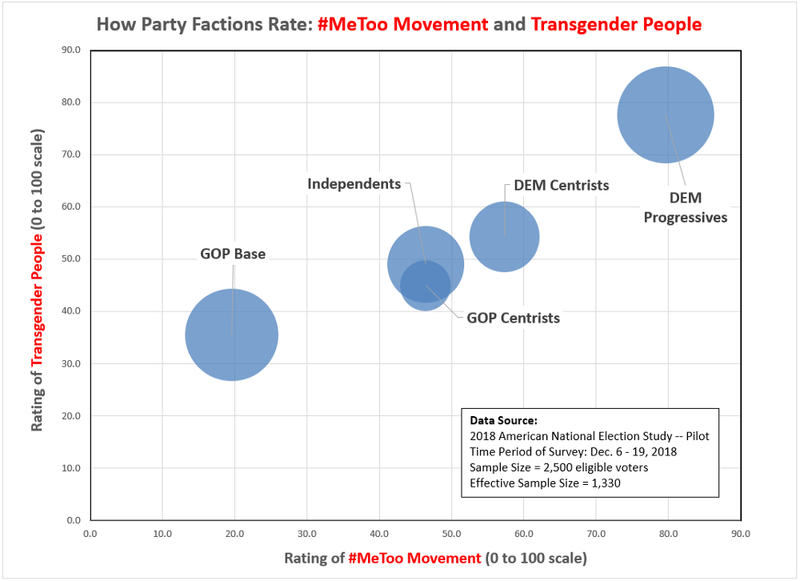 By comparison, feelings regarding Trump and party faction membership (DEM Progressive, DEM Centrist, Independent, GOP Centrist, GOP Conservative) generate a Kendall tau-b statistic of 0.70, indicating a much stronger relationship. Likewise, political attitudes and feelings towards Trump achieve a Kendall tau-b statistic of -0.65. 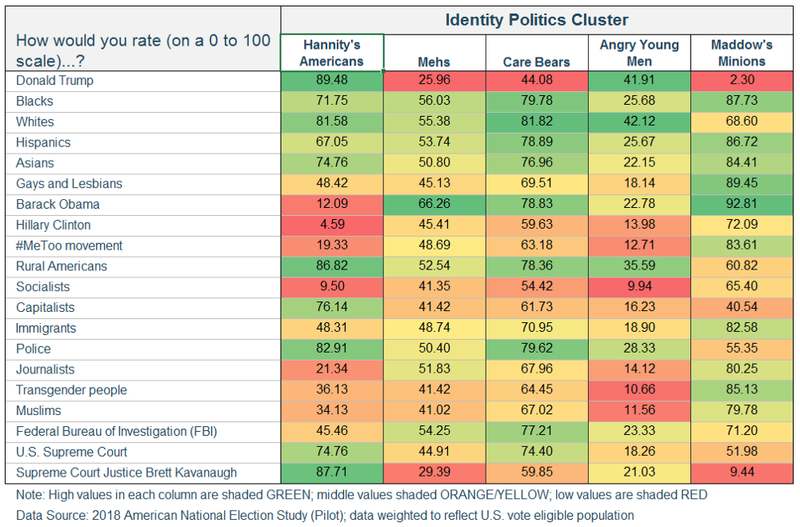 In a multiple regression model with controls for party identification, age, gender, and political attitudes, the racism index is a significant, independent predictor of feelings towards Trump. 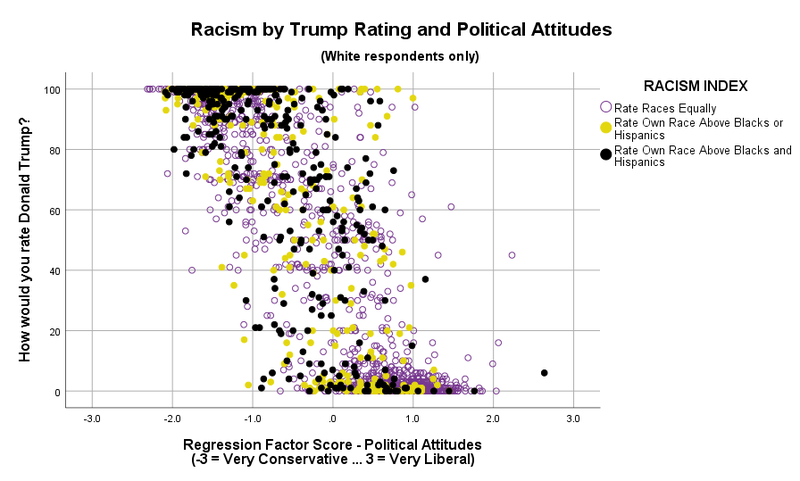 However, relative to political attitudes and party identification, the racism index is a minor contributor in explaining feelings towards Trump (see Appendix for the linear regression model summary output). It is oddly refreshing that Americans appear willing to express their racial biases on a national opinion survey (even if it still may be an under representation of actual racial bias levels in the total population). If our goal is to reduce all types of racism in this country — assume we can never eliminate it — a good start is creating an atmosphere where everyone feels comfortable talking about their own racial attitudes without fear of shaming and retribution. German Lopez’ excellent article on Vox.com is a good place to start the process of generating ideas and strategies for reducing racism. As Lopez points out, there are ways to reduce racial bias, but “calling people racist isn’t one of them.” And that is pretty much the level of dialogue we are treated to on a daily basis on cable news channels and social media. Whatever the motives and intentions of these media lords, they aren’t working to reduce racial bias. Knowing this, it is encouraging that Americans from all perspectives seem willing to share their attitudes and beliefs on race with survey researchers. Its a good start in the long process of creating a healthy environment conducive to racial understanding and acceptance. Linear regression model for explaining ‘Feelings towards Trump’.